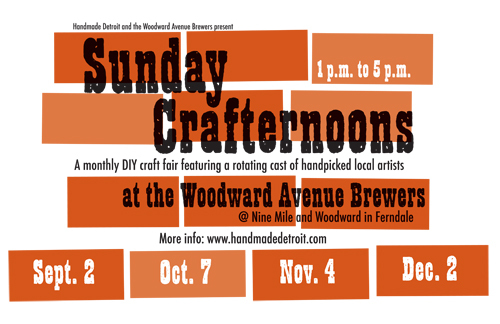 Yep, there’s a Crafternoon at the Woodward Avenue Brewers, 9 mile and Woodward Ave., this Sunday! I keep forgetting to post about it, but it’s totally happening. Because it’s a holiday weekend, we’ve moved it to 1 p.m. to 5 p.m. Stop by on your way to the Jazz Fest or Belle Isle Races. It’s still the same crafty goodness (free to browse, and all ages) in an intimate environment you remember. And if you haven’t made it out to one yet, this is a particularly good one — the first Fall Crafternoon — featuring a few old favorites and some brand new Crafternooners. p.s. Crafternoons will run noon to 5 p.m. for the rest of the year. If you’re interested in vending at one, we’re still taking applications. Check out all the info about that on the SC page.